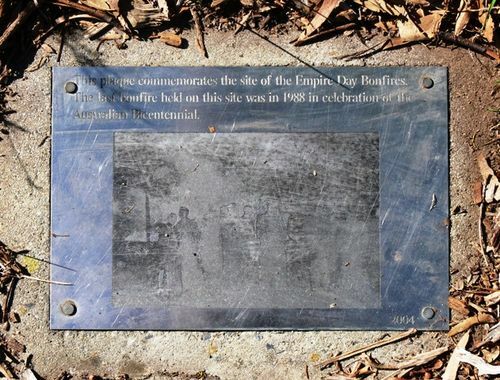 A plaque commemorates the Empire Day bonfires. Originally celebrated on 24 May (Queen Victoria`s birthday), popular observance declined in the postwar period. Renamed (British) Commonwealth Day in the 1950s, and moved in 1966 to 11 June it was more commonly known as Cracker Night and celebrated by bonfires and the lighting of fireworks until stricter government regulation reduced their availability. Empire Day was observed in state schools from 1905 with a program of addresses, pageants and patriotic songs, with children swearing allegiance to King and Empire with a loyal declaration. Also known as Flag Day, Empire Day saw the city decorated with flags on principal buildings and cable trams. This plaque commemorates the site of the Empire Day bonfires. The last bonfire held on this site was in 1988 in celebration of the Australian Bicentennial.